Gríma, son of Gálmód was Théoden’s chief staff. Those of us who are familiar with bureaucratic organizations are likely to read through that line and fill in the missing word, “of” and never notice that it wasn’t there. Others may note that it wasn’t there and complain in passing about the sloppy writing. Here are my two responses: a) please note that the “of” is not there, and b) it isn’t because of the sloppy writing. I call Wormtongue Théoden’s staff because Théoden leans on him. He leans on him because he can no longer stand upright. He can no longer stand upright because Grima Wormtongue has sucked the strength out of him. How did that happen? I am going to set the stage for this encounter in order to give Wormtongue the role Tolkien has prepared for him. Then I’d like to look at Wormtongue’s disservice to his Lord, Théoden. Finally, I’d like to consider what it would mean to have “an inner Wormtongue,” some part of you that weakens you in the guise of helping you. Théoden son of Thengal is the Lord of Rohan. He is about to be invaded by the armies of the wizard Saruman. It is a time when Théoden should be mobilizing his people and preparing for war, but he himself has sunk into self-pity and fatalism and those of his war leaders most able to meet the invasion have been killed or arrested. Rohan is ripe for the taking. Gandalf the White knows all this, but to persuade Théoden of it, he must get past the barriers Grima has thrown up. In the crucial scene, Gandalf confronts Grima, exposes his treachery and renders him mute. Then he begins to bring Théoden to his rightful office. So that’s the scene. The second question is this: “How does Wormtongue manage to so enfeeble the once-proud lord of a warrior people?” Here are some of the ways; how many there are depends on how you divide them. The notion underlying this essay is that one’s own “inner Wormtongue” will do in your life (or mine) what Tolkien’s Wormtongue does in Théoden’s life. Here’s the first. Saruman is preparing to attack Rohan in force. Although Théoden doesn’t know that, Éomer, one of the leaders of his army does know it. Éomer asks permission to go fight Saruman’s orcs. Théoden, on Wormtongue’s advice, says no. Éomer goes anyway. When he returns, Wormtongue throws him in jail. This is the largest and boldest of Wormtongue’s initiatives. Théoden’s life is in imminent danger and all his responsibilities to his kingdom are being disregarded. There are two modern ideas here. 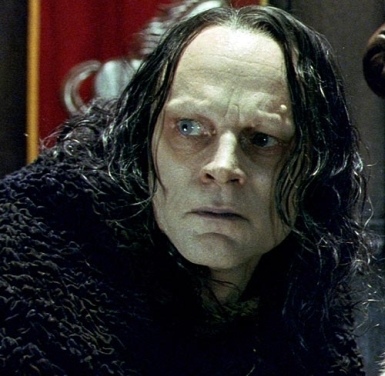 If you were the president of a company that was going rapidly bankrupt and your CFO kept you from finding out, that would be like Wormtongue. Or if you were faced with a hostile takeover and needed urgently to mobilize your company to fight it off, but were kept from knowledge about it, that too would be like Wormtongue. The other side of Wormtongue’s treachery is more personal. Let’s say that in order to bring yourself back to full functioning, you needed to engage in physical therapy or regular exercise; or let’s say that most of your strength of character was atrophying because you never went into the world any more to meet its challenges. Let’s say that doing any of the things that would restore you to active functioning were discouraged. Or, let’s let Wormtongue say it. Those who truly love [you] would spare [your] failing years. Now the argument pivots and turns to uniting them (just Théoden and Wormtongue) against a common enemy—it is a social distraction. Let others deal with these irksome guests. The “guests” are not only irksome, but they can be characterized as enemies of the realm. And then a scheduling distraction. Your meat is about to be set on the board. Will you not go to it? Théoden says that there is no time; that the army is about to take the field. Wormtongue’s reaction constitutes a third distraction. Are none to be left to defend the Golden Hall of your fathers, and all your treasure? None to guard the Lord of the Mark? Théoden says that no one will be left behind, not even Wormtongue. Wormtongue will ride into battle with Théoden. Wormtongue unleashes his final attack at this point, Théoden’s obligation to him. That gives us, in order: a) Do not put a heavy burden upon yourself, b) distract yourself by thinking of the abrasive character of these intruders, c) you really ought to keep to your schedule (it’s mealtime now), ad d) you owe me for my long years of service. Notice that Wormtongue separates these elements of Théoden’s life, making of each one a claim. About the first, he says that no urgent need demands your attention, that you are only “wearying yourself.” About the second, he says that you need not pursue your own vital interests, because you can shift your focus to the immediate irritations confronting you. About the third, he says that nothing Théoden has to do is as important as keeping to his schedule. (Nothing suggests, by the way that Théoden is hungry. The claim in that it is dinnertime!) 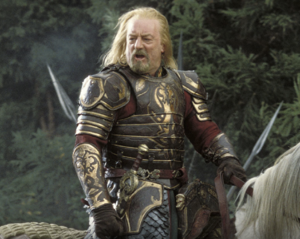 About the fourth, he says that Theoden should not act with the kingdom’s best interests in mind because Théoden owes Wormtongue a debt of gratitude that prevents such action. Théoden reweaves the four threads into a stout rope and, returning the attention to the effect of Wormtongue’s tutelage, loops it adroitly around Wormtongue’s neck. 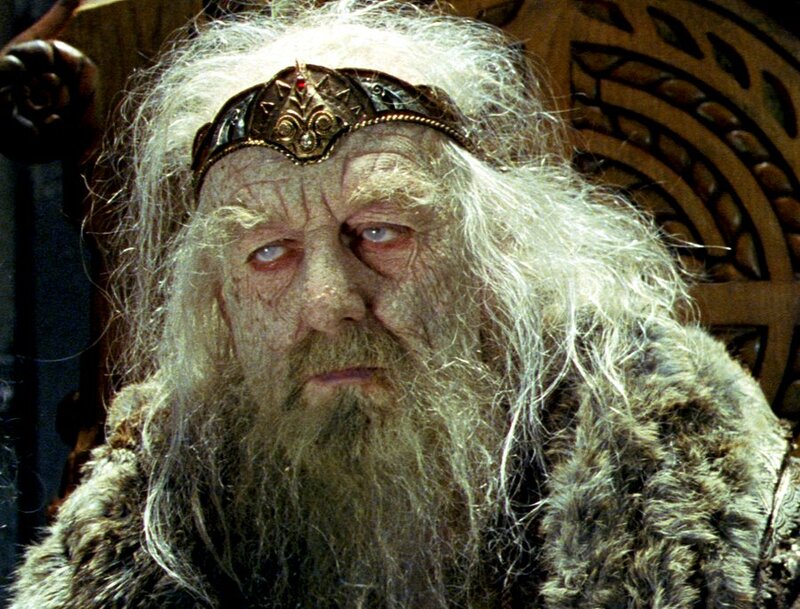 I will look, Théoden says, at the effects of your tenure in office. It is by those effects that I will judge you. I will not be distracted any longer. That’s how the king dealt with his Wormtongue. I hope I will be able to do as well. The etymological evidence for this derivation of “staff” is mixed, I’m afraid. The Barnhart Dictionary of Etymology lists this meaning in English from the year 1000. Others identify a staff that officers carried as the source of the image. Having spent quite a few years as staff myself, I can confirm that being a staff person means getting leaned on a lot, so I’m following that line. The Two Towers. This story begins on page 501 of the Houghton Mifflin paperback I am using. This entry was posted in Books, Getting Old, Living My Life and tagged enfeeblement of power, J R R Tolkien, Théoden, the dotard kind, Wormtongue. Bookmark the permalink.